Every pot or pan was designed for a certain cooking technique or even dish. We often don't think about that and use our pans not properly. But sometimes it can lead to spoiling a dish or even kitchen equipment. So, let's find out a little bit more about pots and pans we use. 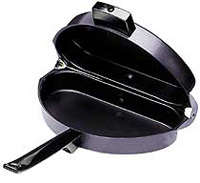 Braiser Pan – a heavyweight pan for stove and oven, it can be used to cook different dishes. 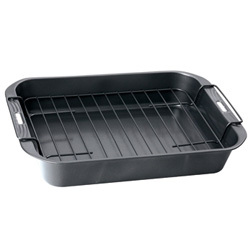 Broiler Pan – a pan for oven, that consists of 2 parts: pan and broiler plate lid. It can be used to cook steaks, roasts, or various cuts of meat, poultry and vegetables. 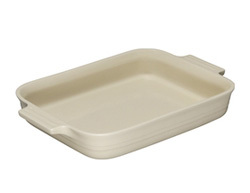 Casserole – a round or oval pan with steep sides for oven and stove. It can be used to cook one-dish meals and meals which are served in the casserole pan. 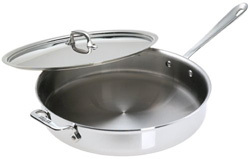 Chef's Pan – a deep pan with long handle. It is used for sautéing, frying or steaming greater amounts of foods. Chestnut Pan – it is designed for heating the large, brown shell variety of chestnuts over a stove, open fire, gas or hot coals. 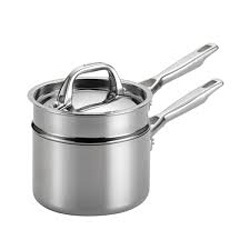 Double Boiler – it consists of 2 pans where one sits inside of the other. It is used for making delicate sauces. 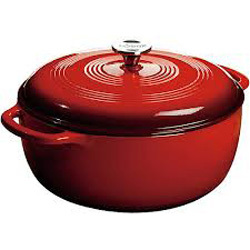 Dutch Oven – a heavyweight pot with a domed cover for stove and oven. It is used for pot-roasting, stewing, braising, boiling pasta and making soup. 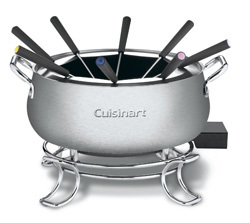 Fondue Pot – it consists of a pot with a heat source like a portable cooking fuel or an electrical heating element placed directly below the pot. It is used for making fondue. 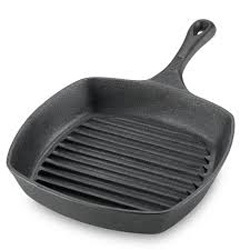 Frying Pan / Skillet – a flat bottom pan with short sides made of heavyweight material. It can be used for frying and sautéing. 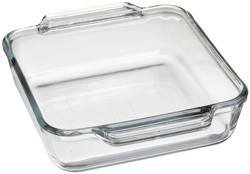 Glass Baking Pan – such pans of high-quality can be used for stoves, ovens and microwave ovens. It is used to bake breads, fish, meats, vegetable dishes, casseroles, cakes and other desserts. 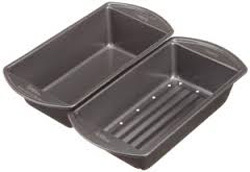 Gratiné pan – it is used to make the traditional French food dish that is prepared with a brown crispy top crust. It has flat bottom and short sides. 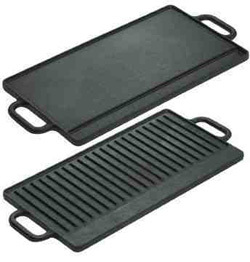 Griddle – a flat pan with a long handle for oven, stove, open fire or grill; usually it has a non-stick surface. It can be used to cook pancakes, hamburger patties, eggs, bacon, small amounts of meat, and grilling vegetables or fruits. Grill Pan – a heavy metal pan which consists of ridges spaced evenly across the bottom; its form helps to grill meat, fish, vegetables etc. Also it is designed for fat containing food, during frying fat collects between the ridges. Meatloaf Pan – it consists of 2 pans where one with holes sits inside of the other without holes, such construction helps to remove extra fat. It is used to bake meat. Omelette Pan – it looks pretty much like a simple frying pan, but it always has a non-stick surface and high sides. It is used to cook omelettes, fish filets, shell steaks and so on. 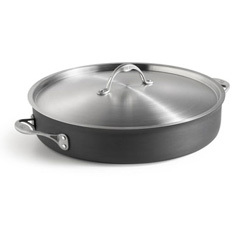 Paella Pan – a large, shallow skillet-like pan specially designed for cooking Spanish paella. 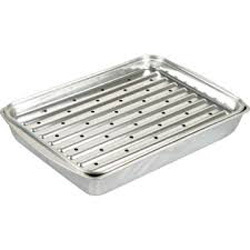 Roasting Pan – a rectangular shaped pan for meat cooking with low sides, which allows the heat from the oven to reach the entire surface of the meat to create a browned exterior. Usually it is used with a special rack to prevent meat boiling in its own juices. 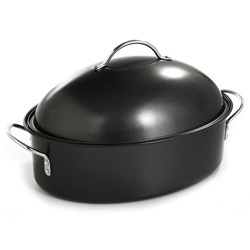 Roasting Pan with High Cover – an oval shaped pan with deep sides and a large domed cover. Such construction makes an oven inside of an oven, which helps to cook meat more quickly and tenderly. 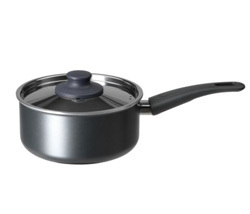 Saucepan – a round pot with high straight sides and a flat bottom. It has a snug fitting cover. It is used to cook vegetables, heat soup, and make sauces. 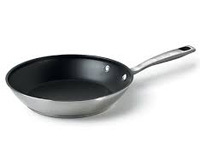 Sautéing Pan – a pan that looks like a frying pan, but has short, straight sides. There is a long handle and a cover. It is used to sauté and fry food. 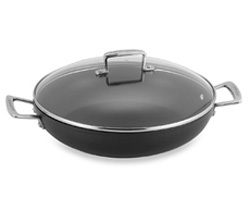 Sauteuse Pan – a round, lidded pan with small handles. It is used to sauté and braise food, like cooking casseroles, stews, pasta dishes, meat and poultry dishes. 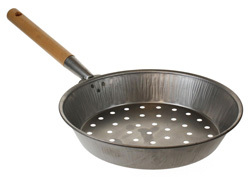 Stir-Fry Pan – a round deep pan for stir frying. 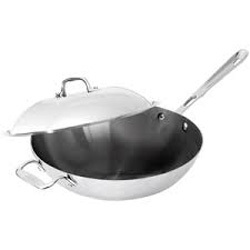 There are several types of stir-fry pans, one of them is a wok. It is often used to mix different ingredients, like meats, vegetables and sauces. 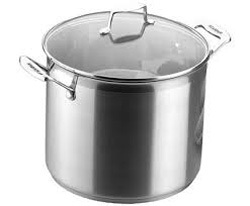 Stockpot – a deep, straight-sided pot, taller than it is wide. It has 2 large handles. It is used for cooking stock, soups, stews, thick soups, chili and for boiling pasta. There can be a pasta insert for this pan – perforated insert that is put inside the pan to drain pasta easily after boiling. Wok – a bowl made to quickly cook food over high heat. It has rounded or flat bottom. It is often used in eastern cuisines like Chinese, Tai, Japanese, Indonesian, Indian etc. 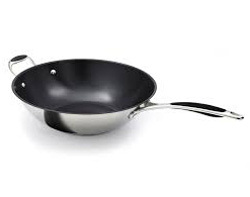 Wok may be used for stir-frying, sautéing, steaming and deep-frying.